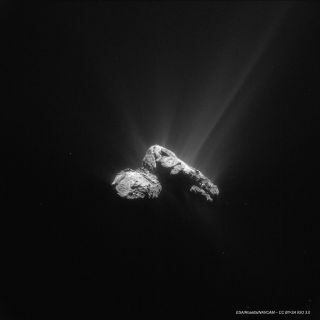 The Comet 67P/Churyumov–Gerasimenko as seen by the European Space Agency's Rosetta spacecraft on July 30, 2015. The comet made its closest approach to the sun, called perihelion, on Aug. 13. NASA astronauts at space-grown lettuce for the first time, Elysium Space joins the moon-burial business, and Comet 67P, currently being orbited by the Rosetta spacecraft, made its closest approach to the sun. These are our picks for the best space stories of the past week.